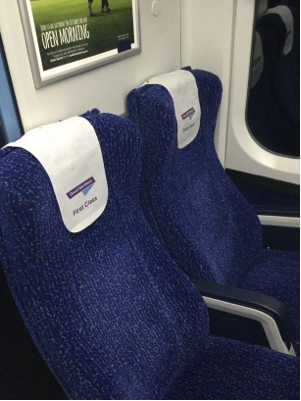 Is there a clear way to tell on British trains (generally) which seats/tables are reserved seats? In Germany we definitely made some mistakes accidentally taking seats that were eventually reserved, in part because they weren't clearly indicated in some cases (and some because we didn't know what to look for). In this question I'm referring to National Rail trains, not London Underground or similar which would not have reservations (I assume). Medium to longer distance trains, such as London-Manchester or London-Sussex. 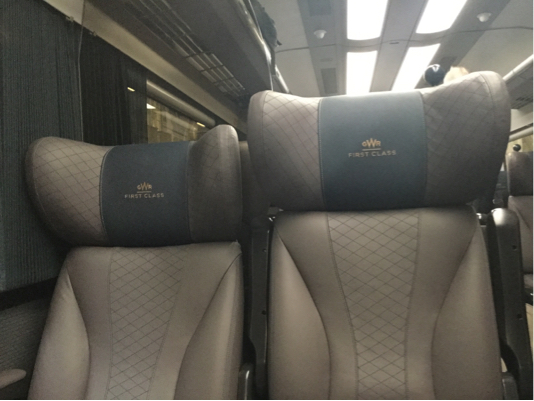 There are three broad classes of trains, when it comes to seat reservations. Electronic Displays, Card notices, and None! If there's no ticket card thingy above the seat, then either it isn't reserved, or there has been a problem with the seat reservations printer... The latter is rare, but does happen, and is announced if so. If your seats look like this, they're free! 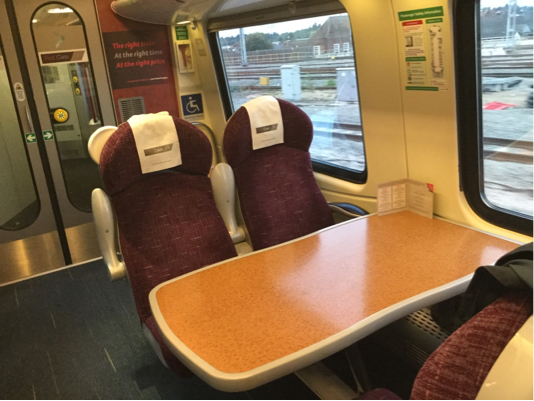 In standard class, 4 seats round a table are generally very rare on long distance services, so unreserved ones get sat in quickly. For standard class, reserve if you can! 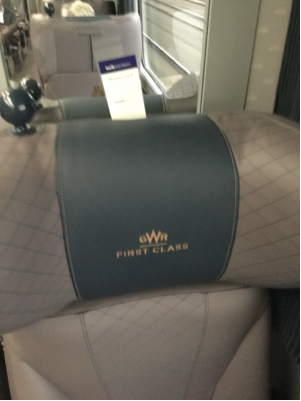 In first class, they're more common, but still often the first ones taken. Outside of peak times you should normally be fine to find an unreserved one to sit in. Train seats have a slot on top of them. In this slot a paper card is placed on which is printed between which two stations the seat has been reserved. After some googling I found this image. In that image you can see those cards. This makes obvious that the seat is reserved at some point of the journey. To find out if it is reserved on the part that you care about, you can start reading the card. Sometimes it takes a while to find one that is not reserved for the duration of your journey. I've also seen it happen that the someone accidentally pushes such a card, causing it to fall on the floor. The system is certainly not fool-proof, but in general works rather well. Advantage over the German system is that those cards are very hard to miss. 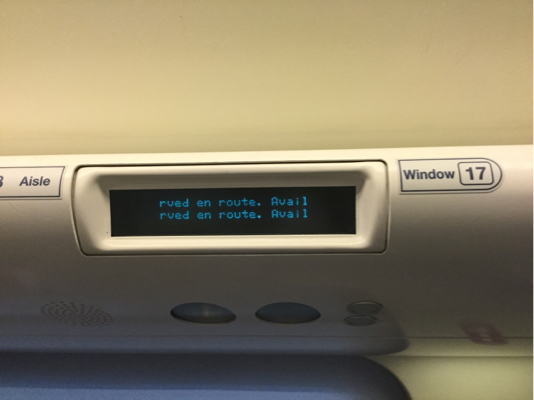 On some trains (put rather few in my experience) the system with a little electronic screen above the seats is used. I believe this is also used in Germany, so in that case you have a good idea what to look for, but it is much easier to miss than the paper cards. When you board the train at its departure station it can happen that the personnel still needs to put the cards in place. Don't be surprised, just read what it says and eventually move to another seat if that happens. When you occupy a seat reserved by someone else, the same thing as in Germany usually happens: the person claims his seat in a friendly way, you apologize and move to another seat. Not the answer you're looking for? 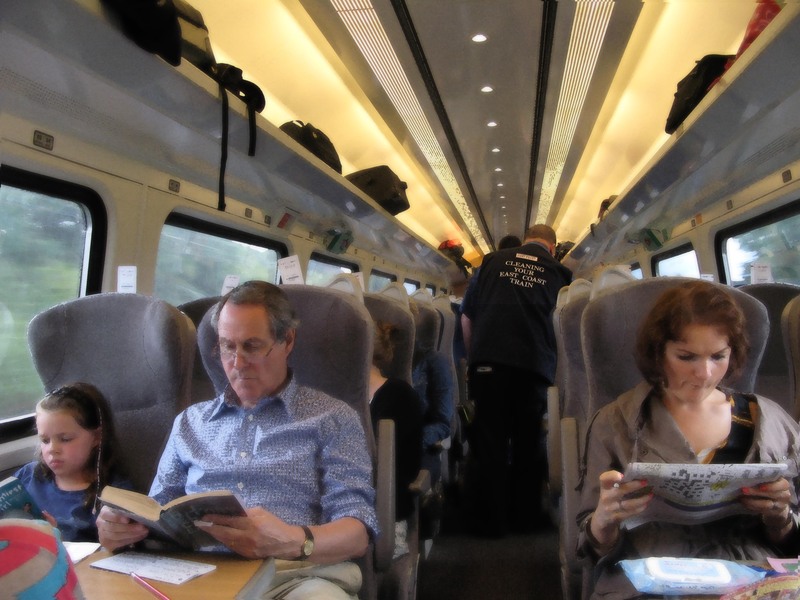 Browse other questions tagged uk trains tips-and-tricks national-rail or ask your own question. What does the letter “A” signify at the end of the expiry date on a British rail ticket?